Join our webinar to learn how you can use Cadence PSpice technologies to simplifying the complexities of mixed-signal verification, performing “what if” analysis, and validating the complete system check for failures. 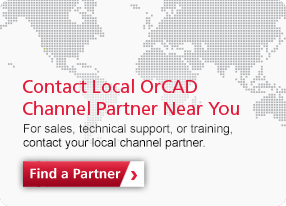 The new reference design library provides OrCAD Capture users with access to over 12,000 (and growing) reference designs directly within their current schematic capture environment. From a very small business, MyDefence have in short time grown into a large – and still growing - business in science- and technology industry, and is in cooperation with some of the largest Danish and international organizations. G5 is a long-time user of Cadence® OrCAD® PCB design tools, with OrCAD PCB Designer Professional, OrCAD Capture CIS, and OrCAD Component Information Portal in its toolbox. Using OrCAD products, the engineers have been able to address the design and routing challenges for its core products and beyond. Today at CDNLive EMEA, Cadence Design Systems, Inc. (NASDAQ: CDNS) announced new capabilities for OrCAD® Capture, PSpice® Designer and PCB Designer 17.2-2016 that address challenges with flex and rigid-flex design as well as mixed-signal simulation complexities in IoT, wearables and wireless mobile devices. This latest release reduces PCB development time by addressing the need to design reliable circuits for smaller, more compact devices. The easy-to-use constraint manager in the OrCAD tool helps us manage hierarchical design rules by regions and enables online DRCs as immediate feedback. This is essential to keep up the hardware development speed iwht the fast softwrae changes in the IoT market. With OrCAD and the integration to our Arena PLM tool, we are able to create a BOM component once, and it is the same BOM component used in Capture CIS, PCB Editor, and in Arena. With Cadence PCB design flow, Solid State Logic can achieve first-time-right design accuracy, which helps the team meet their aggressive product delivery deadlines while giving them the ability to quickly release product upgrades.